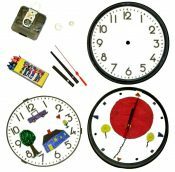 LETS YOUR CHILD OR STUDENTS CREATE THEIR VERY OWN CLOCK FACE USING THE CRAYONS PROVIDED OR THEY CAN USE STICKERS AND MARKERS TO BUILD THEIR VERY OWN CLOCK. MAKES A WONDERFUL GIFT FOR CHILDREN! !